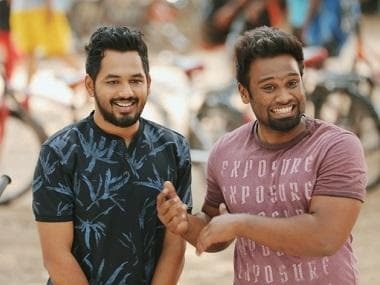 After working with Vishal in three consecutive projects of different genres in Theerathaa Vilayattu Pillai, Samar and Naan Sigappu Manithan, director Thiru has now collaborated with Gautham Karthik for his fourth film Mr. Chandramouli which is gearing up to hit screens this week on 6 July. "When I was scripting Garuda, I got the idea of a one-liner which is now Varalaxmi Sarathkumar's track in the film. And when Garuda had to be put off, I started to work on that idea and that's how Mr. Chandramouli happened. Gautham and I had plans of collaborating already, and I felt he would be apt for the character Raghav. Fortunately, Dhananjayan sir had Gautham's dates and he was looking for a script," Thiru told Firstpost in an exclusive chat. "After building the script, I narrated it to Dhananjayan and he liked it. He wanted to try Karthik sir for the father role once the narration was over. I liked the idea too but when we first approached Gautham, he said that Karthik has been listening to many scripts but rejecting them after narration," said Thiru, adding that he still wanted to narrate the script to Karthik before they check other options. "It took a month to meet him; meanwhile, I changed many sequences for him and at some point, I couldn't imagine anyone else in that role. After a month, we went for the narration and to our surprise, he gave his nod right then." Gautham has been one of the busiest heroes in K-town in the last two years, shooting for multiple projects back to back and with continuous film releases in theaters. "I have watched Gautham's Rangoon and Ivan Thanthiran. And I loved his performance in those films. I haven't watched his Kadal and Gautham knows that too. So none of his other movies or performances influence me. This script has a lot of scope for his acting skills. I hope we achieved what we wished," said Thiru. Talking about his meeting with veteran actor Karthik, who was last seen in Suriya-starrer Thaanaa Serndha Koottam in January, Thiru said, "After I narrated the first half to Karthik sir, he asked, 'The script is great but should I do this?' As I narrated him the second half, he was quite impressed and asked, 'When are we going on floors?' I could sense that he predicted the second half but when I told him something he didn't expect, he wanted to give it a shot." A section of the audience has criticised Thiru's films for the kind of bitter pill he packs into the story every time, as a mystery element. "Samar was not received well by the audience; they felt the concept (was) entirely alien. But now, when they watch Bigg Boss, it's quite the same format I tried to convey in Samar. Maybe it would have been very relevant if it was made now. In Mr. Chandramouli, we have a crime track involving call taxi services. Every day, we come across such crimes from various parts of our country. After they watch this film, the audiences will think twice before they book a cab," stated Thiru. The sensuously shot track 'Yedhedho Aanene' has become a viral hit on YouTube, crossing 3.5 million views already. But the shooting process of the song was quite demanding, says Thiru. "It was quite a task. I always love beach songs and I had this song in the script itself; it was not forced in the film. Regina was apprehensive about this song; she felt it unnecessary. After I did some explaining, she was ready to do the song. I sent her some reference pictures and then Regina (Cassandra) went on a diet and workout regime to look good in the swimsuits. Only if she feels comfortable, it will look nice on the screen; else it will be awkward or vulgar. So it's essential that artists should feel comfortable about what they wear. We had a tough time shooting underneath the water, Karthik and Regina had to memorise their lyrics and recite it pretty fast below the water; they have to be stable. It was a very complicated process," said Thiru about the song which is shot in Krabi Islands, Thailand. Thiru also revealed Varalaxmi plays a proper role in the film and appears throughout the second half. "Her character is the crux of the film. She has a beautiful role: Bairavi, a very soft-spoken person. It's her role I enjoyed the most while writing. She comes throughout the second half and she's equally as important as everyone else in the film." On a concluding note, Thiru said, "Mr. Chandramouli will be my personal favorite of the four movies I directed so far. The father-son emotions, that too while shooting with a real-life father and son was very overwhelming. I'm sure audiences will be able to connect with the emotions on screen. This film has been a very satisfying and fulfilling experience for me."